“We celebrate the affirmation of state law HRS 343,” say plaintiffs. 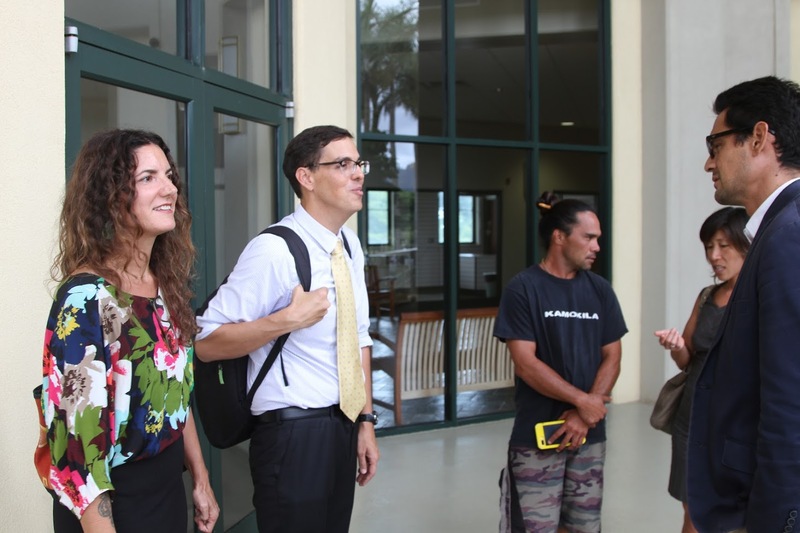 Plaintiffs in a lawsuit brought by Ke Kauhulu o Mana against the State Board of Land and Natural Resources (BLNR) and Syngenta welcomed those portions of Judge Randal Valenciano’s ruling today affirming the importance of HRS 343 while rejecting his conclusions on other aspects of the case which they intend to appeal. “We are immensely pleased that Judge Randal Valenciano ruled today that state law HRS 343, Hawaii’s Environmental Policy Act DOES APPLY to companies such as Syngenta when they propose new operations on State-owned lands. 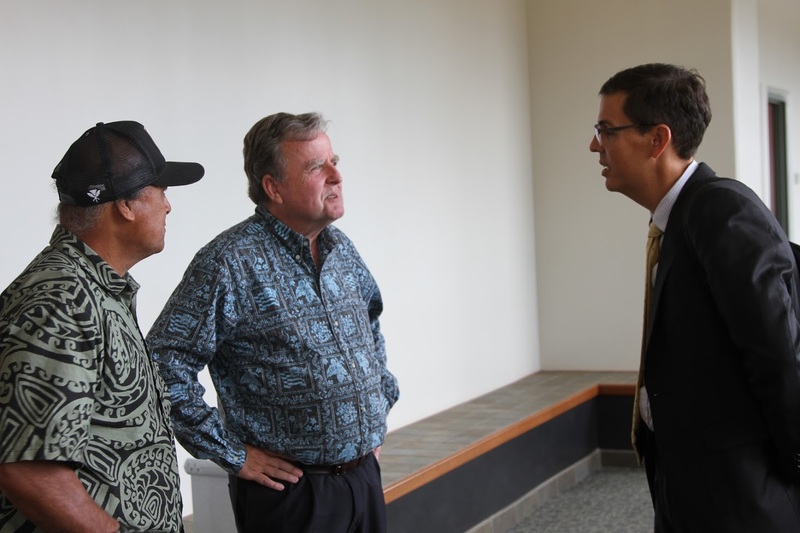 This means leases for any new or expanded operations in the future will be required to go through an environmental review process,” said Gary Hooser, President of the Hawaii Alliance for Progressive Action (H.A.P.A. ), one of the plaintiffs in the lawsuit. Hooserpreviously served as Director of the Office of Environmental Quality Control. “We are celebrating today those key parts of the court’s decision which validate our core position with regards to the demonstrable negative impacts of the actions of this industry on health and the environment,” said Hooser. Gary Hooser, President of the Hawaii Alliance for Progressive Action (H.A.P.A.) one of the plaintiffs in the lawsuit, (left) in conversation with public interest lawyer, Lance Collins. Judge Valenciano found that BLNR was justified in granting Syngenta an exemption from the requirement to do an Environmental Assessment (EA) or an Environmental Impact Statement (EIS) in connection with the lease it obtained recently for use of a parcel of Crown lands. Hawai`i Revised Statute (HRS) Chapter 343 typically requires an environmental assessment (EA) or an Environmental Impact Statement (EIS) for any significant actions or development proposed on publicly-owned, coastal and conservation-zoned lands. The lands in question are on the west side in Mana adjacent to the coast, just about three quarters of a mile from Kekaha, and close to Targets, a popular recreation spot. “We are disappointed the judge ruled that this parcel of land in Mana was not required to go through environmental review. But he did rule that Syngenta’s use of state conservation land is subject to Hawaii’s environmental review laws. Until reviewed by a higher court, this means that any new leases or expansion of operations on state lands, in the conservation district or within the shoreline must go through normal environmental review,” said public interest lawyer, Lance Collins, who represented the plaintiffs. “We believe the Judge’s decision to exclude the BLNR’s revocable permit to Syngenta for the land at Mana is erroneous. We will appeal that point to a higher court,” added Collins. Anne Frederick, Executive Director of H.A.P.A. with lawyer for the plaintiffs, Lance Collins. Night-time activity involving the use of bright lights is known to impact endangered species such as the ‘a’o (Newell’s Shearwater) and ua’u (Hawaiian Petrel). The Kauai Endangered Seabird Recovery Project has reported that between 1993 and 2013, populations of the ‘a’o declined by 94 percent while the ua’u declined by 78 percent. The federal permits held by Syngenta to grow experimental crops state clearly that the activity is occurring in areas where critical habitats for endangered species exist. “We will continue the fight to protect both our people and the environment,” said Loui Cabebe, of Ke Kauhulu o Mana. Surfrider Foundation and Kohola Leo were also plaintiffs in the suit.